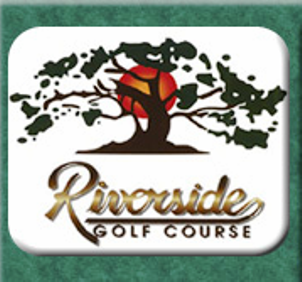 Roy Kizer Golf Course, is a Public, 18 hole golf course located in Austin, Texas. 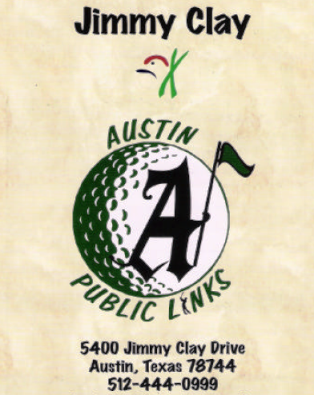 The course is one of six courses owned by Austin Parks & Recreation. The six courses are: Hancock Golf Course, Jimmy Clay Golf Course, Joe Balander Golf Course, Roy Kizer Golf Course, Lions Golf Course, Morris Williams Golf Course. Roy Kizer Golf Course first opened for play in 1994. The course was designed by Randolph P. Russell. This links-style course spreads out over almost 200 acreas bordered by cedars, elms and oaks. 35 acres of lakes and 22 acres of wetlands have been created for resident and migratory waterfowl. The terrain is flat, plus numerous sand bunkers guard the fairways and greens, and the wind is frequently a factor. Despite the acreage devoted to lakes, Roy Kizer Golf Course is suitable for players of all levels. Ample fairways and the choice of 5 sets of tees provides each golfer the opportunity to play a course that fits their skill level and a variety of ways to negotiate the challenges. 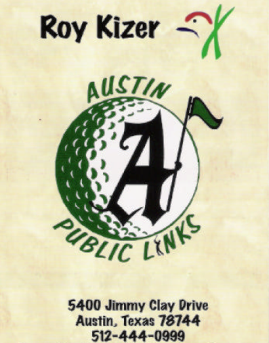 Roy Kizer Golf Course is one of two 18-hole courses co-located at the Jimmy Clay-Roy Kizer Municipal Golf Courses facility in Austin, Texas. Roy Kizer Golf Course, was converted from an abandoned Wastewater plant. This 6,857 yard, par 72 course embodies the design philosophy "to give pleasure to the greatest number of players without respect to their capabilities." Usually walk on as a single on Saturday mornings, course in excellent condition when I played, teed off at 6:50 pace of play was 3.5 hours for our group. Kizer is one of those courses you want to go to when you want to find out how well you're scoring, but you don't expect the place to just lay down for you; even in light wind, you'd better pay attention to your ball flight. The City of Austin is obviously pretty proud of the place (and not without reason), so look online for deals (golfnow.com, groupon, etc.). I see through the previous comments that pace of play has been a problem. It still is, and how! Prices are a bit high in prime-time. Play off hours (and walk) to save money. Course is challanging due to water on most holes, and usually the wind will be a factor. I always enjoy the course. Not as hard as others I play in Austin, but still challanging. They are slowly pricing this course out of the market as while "most" of it is usually in good shape, you cannot justify the $ 50 when several other area courses are as good or better and less expensive. Also where are the course rangers to keep play moving? I enjoyed the day. The course is challenging and always windy when I play there. Water comes into play alot, especially on the right. Wind players can go low. Lots of water.